‘Albarello’ is the name given to the drug or pharmaceutical jars of waisted form which became popular in Italy from the fifteenth century onwards. Inscriptions on extant Italian albarelli show that their primary use was in spice stores or hospital pharmacies . The immediate origin of the form was Islamic, and one of the earliest extant examples, from thirteenth century, now in the Ashmolean, is illustrated below [EA1956.178]. 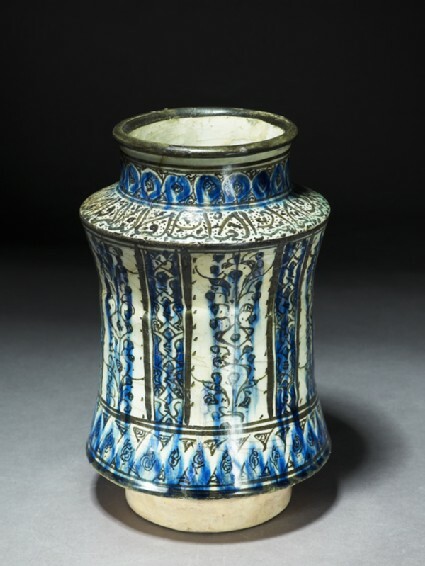 None of the surviving Islamic albarelli are inscribed, and the only piece of Islamic ceramic bearing the name of a substance  is a fourteenth century Syrian jar of a very different form. Hence, although they were almost certainly used for storage, it is impossible to be more precise about their likely contents. Ultimately the shape probably goes back to an Egyptian precious metal form of the Roman period. The Arabic inscription on the shoulder of this albarello makes no sense but appears to be derived from the inscriptions of good wishes so common on medieval Islamic objects (nos. 13-14 [EAX.1302 & EA1956.36]). The verticality of the albarello is emphasised by the stripes on the body, while the band around the lower body balances the horizontal bands necessitated by the shoulder and short neck. The finely-painted underglaze black and the washes of underglaze blue provide a delightful combination of precision and movement for the design as a whole. 2. Examples of Italian albarelli may be seen in the Ashmolean Museum's collection of Maiolica; see also T. Wilson, Maiolica [,] Ashmolean Museum (Oxford 1989) nos. 3 and 22. 3. naufar, a water-lily, and hence a medical preparation from the plant, see Louisiana Revy 27 no. 3 March 1987 no. 142. 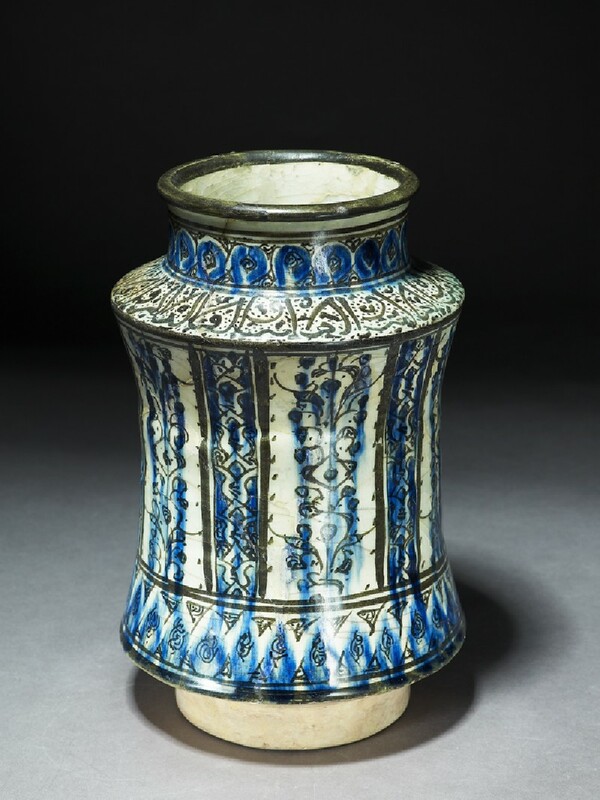 In the Islamic world albarelli, or storage jars, were produced in a range of shapes and sizes based on the kind of substance they were designed to contain. However, unlike those produced in the West, Islamic albarellos rarely bear inscriptions specifying the content.